I can hardly believe it: this is the first time this has ever happened, in my memory. Yall, I have emptied both my email and paper inboxes!!! Shock, awe, horror – the running and screaming in the streets will start as soon as hit Publish, clearly. Obviously, The End Is Nigh! Am I the only one who has trouble keeping these things cleared up…? Now I can tackle the rest of my to-do list – right after this celebratory cake… and maybe some sleep. And hopefully, you’ll even get a proper blog post before too long! 2 Responses » Tagged with: daily life, yay! 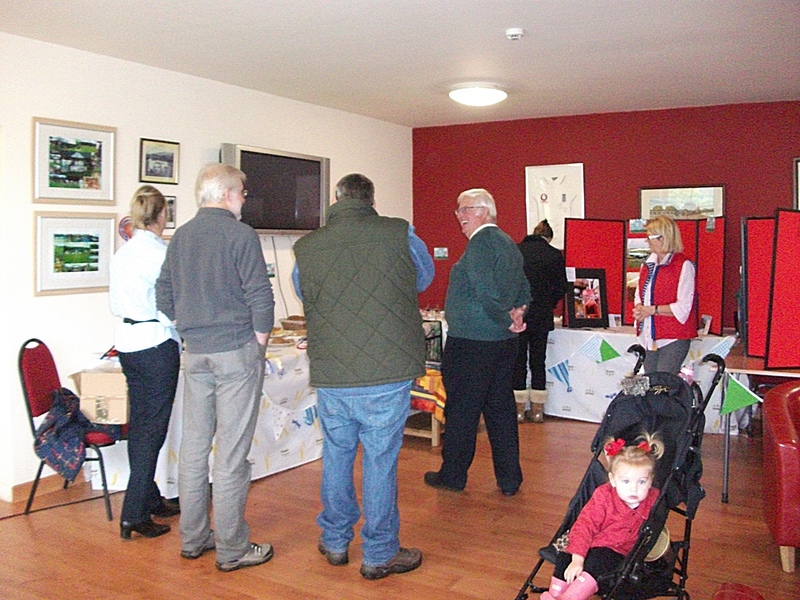 It sounded like a fabulous idea to me – just what the Inspire Festival started out meant to be. 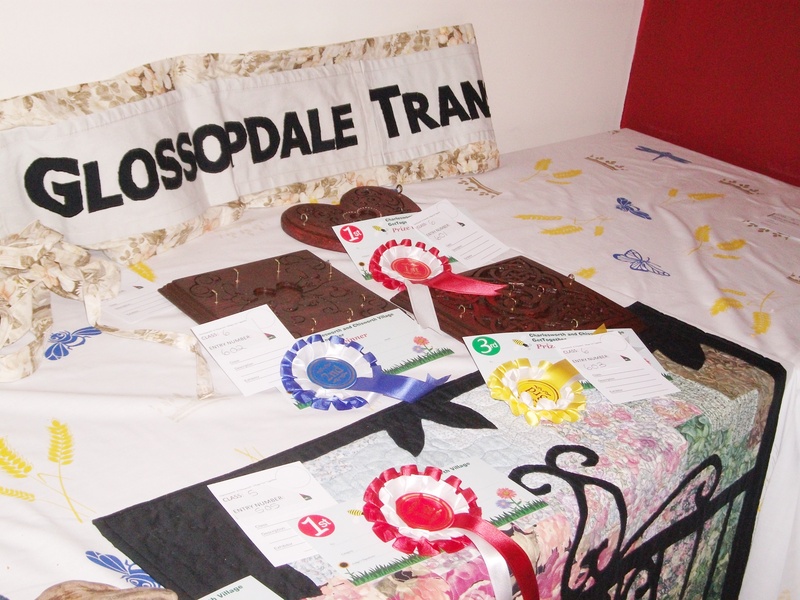 This one, with only a few weeks’ lead time, though, and focused on Charlesworth and Chisworth (two of the small villages that make up Glossopdale), was bound to be smaller. It’s also the first time anyone’s attempted anything like this – at least as far as I can recall in the past five years! I gave the competitions some thought, and feared there might not be many entries, so decided to enter some of the classes, mostly to do my bit towards there being a decent amount of entries. I thought about entering the photo competition, but couldn’t think of any photos that answered the prompt, so gave that one a miss. Of course I’d be entering the cake class and the sewing class – I’ve made one handmade sewn item, which you’ve all heard about by now. Just Friday, I decided I would try to enter a loaf of bread as well – this braided one I do looks nice, so I thought that’d be perfect. 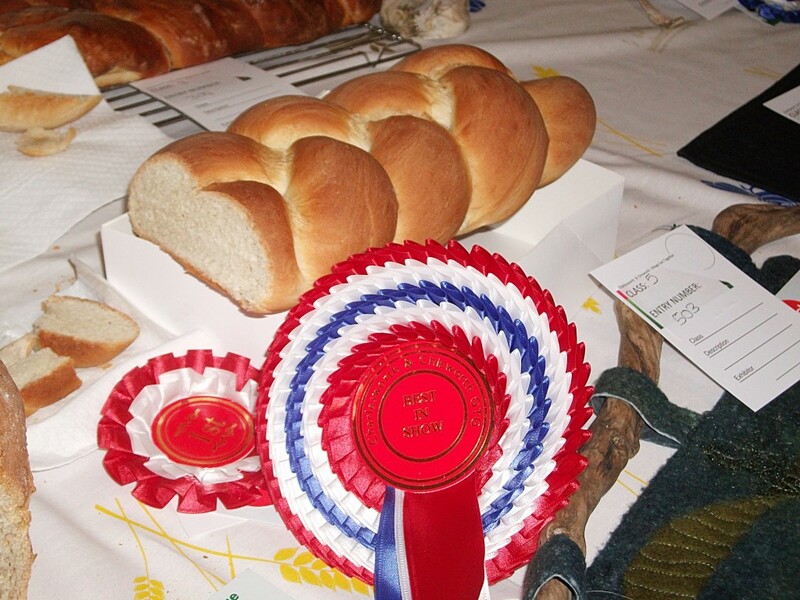 Mind you, I haven’t baked bread in ages – kneading it this morning, I couldn’t actually remember the last time I’d kneaded bread dough – I was just hoping I’d still recognize the point where the gluten chains all line up and the kneading has done its job. Thankfully, I did. 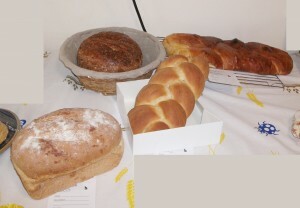 I made no promises to myself or anyone else that the cake and the bread would come together in time – and the bread making it was looking kind of doubtful at 9am this morning, with my departure time due at 10:15, and it just starting its final rise. I must fix that recipe – I had to knead in an extra three cups or so of flour, doubling what I started with, in order to get it to a kneadable state – so kneading it took longer than it was meant to this morning. Thankfully it did rise and bake quickly enough, so I had entries for three classes for myself, plus one for Chris. Turns out I needn’t have worried! 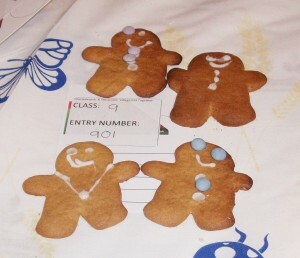 There were a good number of entries, in nearly every class. Yay! 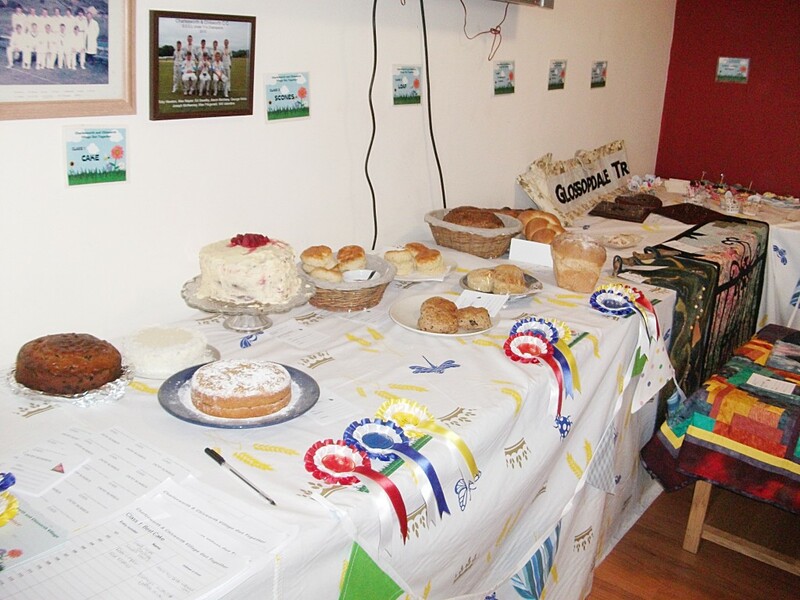 The cake and the scone classes each had four entries. 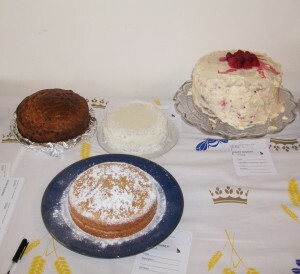 The above flier was all the information there seemed to be on the criteria, so there was some wide variation within each class – looks like a fruit cake, a Victoria sponge, another sponge, and my coconut cream cake were all in the cake class. Scones are what Americans call crumbly biscuits (as opposed to the flaky kind; pondering what the Brits might call flaky biscuits earlier, Chris and I decided we weren’t sure that they’d fit into British vernacular at all, which means – seeing as they’re flour-based – they’d call them cakes). I suppose there’s only so many ways to make those, but we did get plain and fruited varieties. 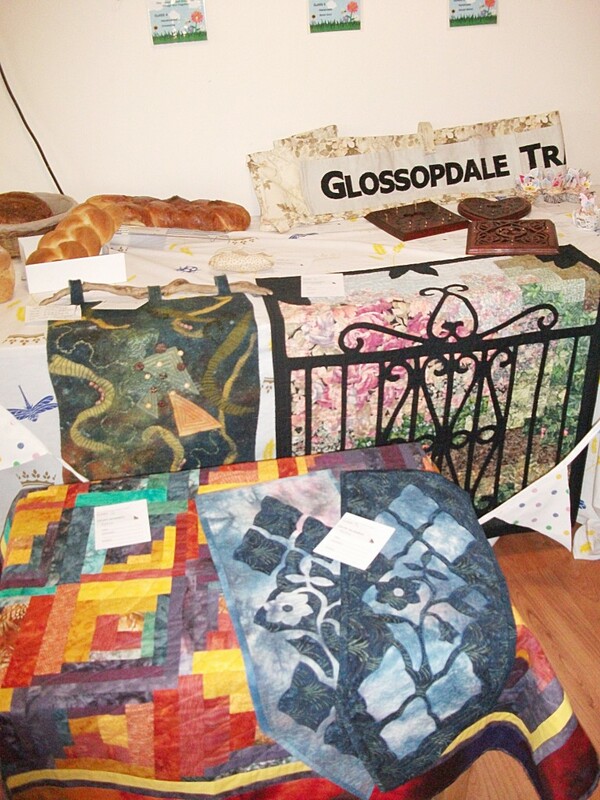 The sewn items category attracted lots of entries, including some absolutely stunning patchwork. My pictures do it no justice at all – but be sure to click on them to see the detail. 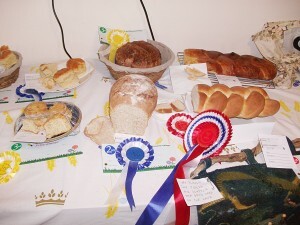 The loaf of bread category also got four entires. The one in the basket was there first, and was the only other one when I went to place my entry. I looked at that basket and thought, “Oh, yeah, presentation. Shoot.” Later, when the glass cake stand appeared with that raspberry cake, I kicked myself there, too: I do actually have a nice cake stand that would’ve done; I just didn’t think about it. So yeah, I decided I wouldn’t present my bread in the foil I’d wrapped it to bring it, and propped it in the cake box top as artfully as I could manage. D’oh. I didn’t think of just setting it on the tablecloth directly, but since it is a crusty kind, I perhaps should’ve done that. 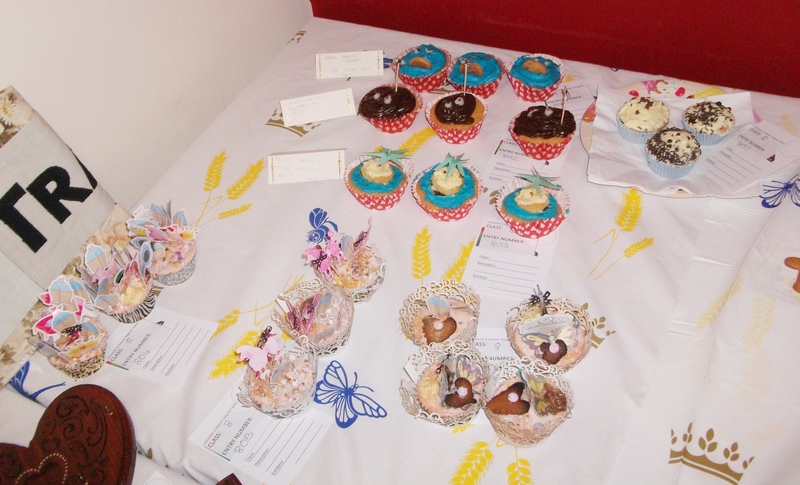 The children submitted several sets of decorated cupcakes. 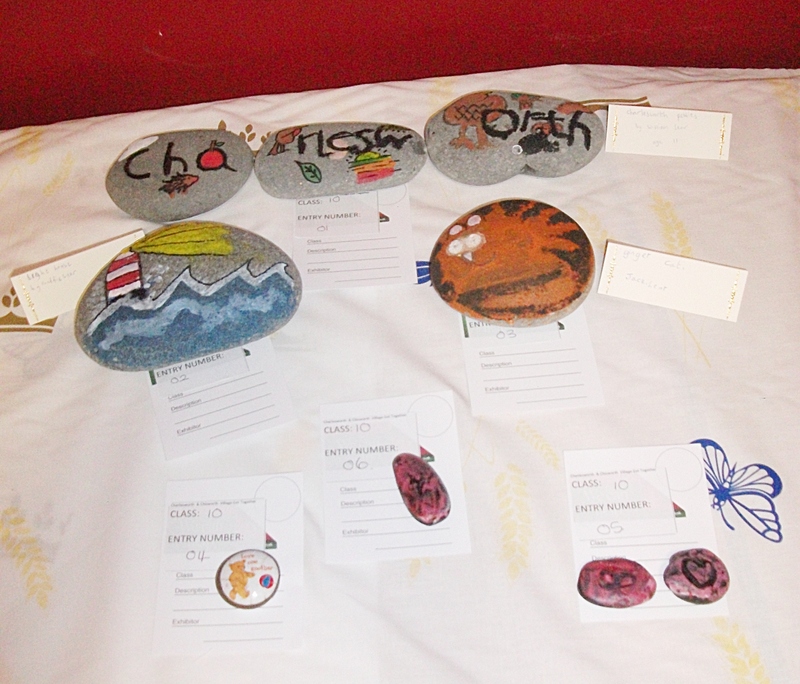 I failed to get photos of the photo (adults) and picture (children) classes, sadly. They were set up on the red boards to the right in this picture. There were some stunning photos, but there were too many people in my way to get decent photos of them, argh! 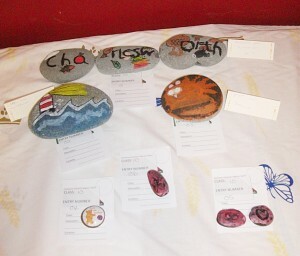 There was also an absolutely lovely picture put together by the kids at one of the primary schools. 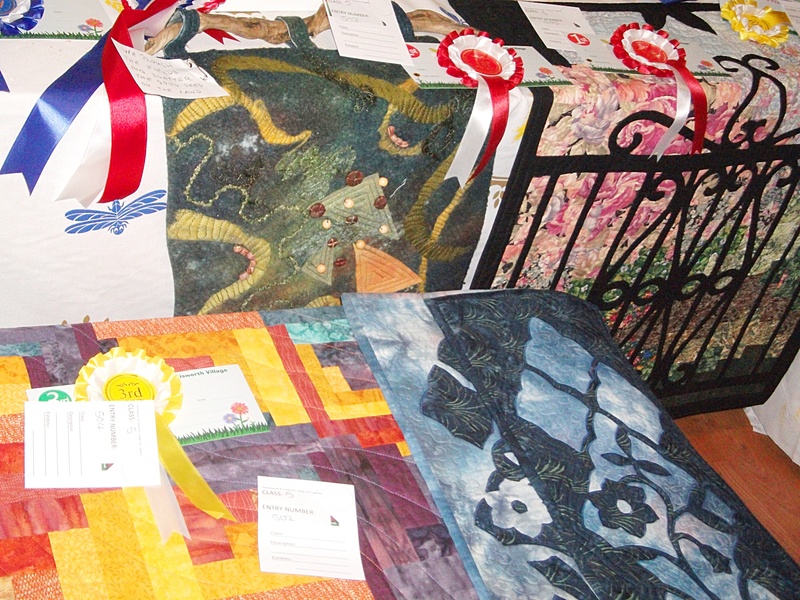 I really don’t envy the judges having to decide about these stunning works of sewing. 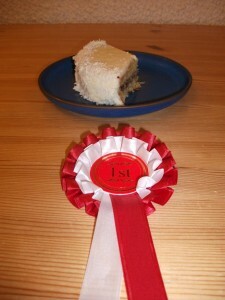 My coconut cream cake came in first in the cake category!!! Woohooo! I cut some up before I left so others could try some. 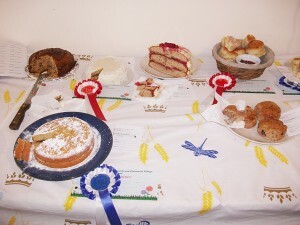 I always think it’s such a waste, all this food that’s prepared for competitions, and then the judges have some, and then it just sits there looking pretty until it’s thrown out. 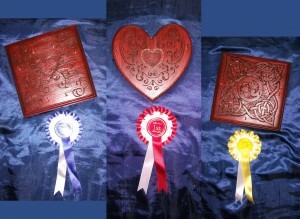 I also think that a good way to improve one’s technique is to enter competitions and learn from what others do – not being allowed to taste the thing hinders that learning process a bit! 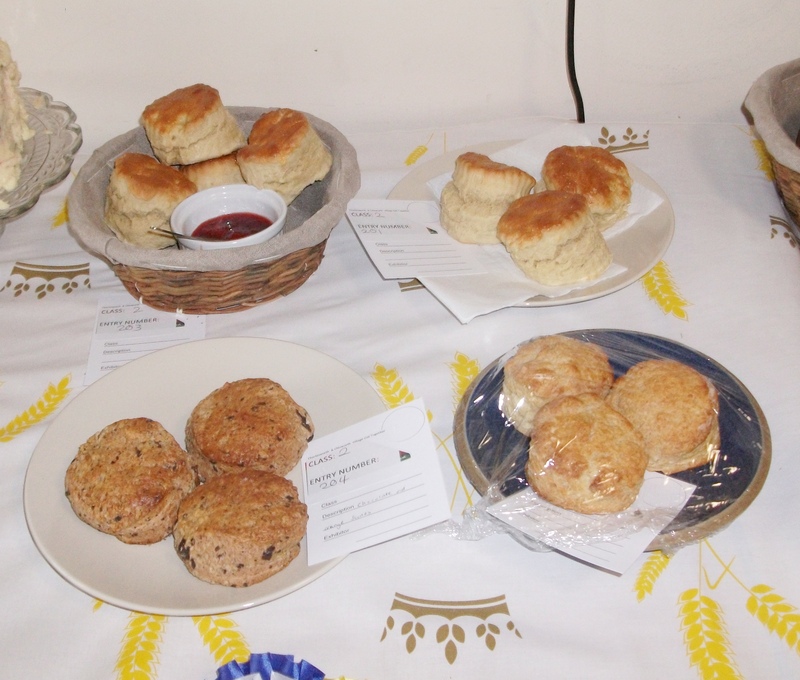 I could at least control my own entries, so I let others have a taste – after judging! Best of all – my cardamom bread got Best In Show!!! WOOHOOO!!! Mind, I’ve never entered one of these things before, and I’ve never been around them, either. I’ve seen the entries on display well after judging, at Bakewell Show and others like that, but I’ve not been involved ever at any level. 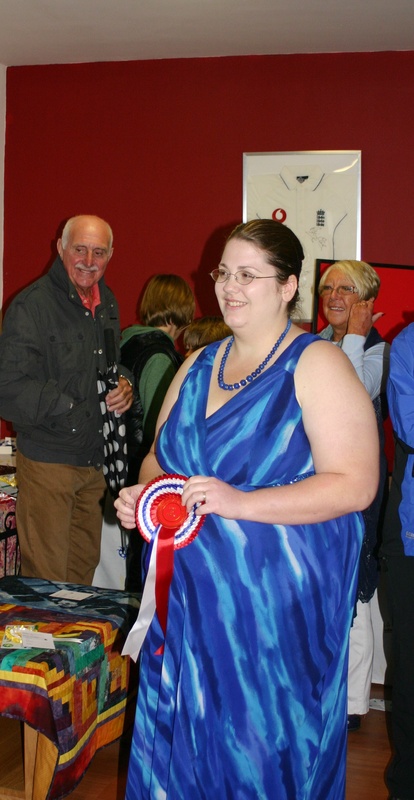 At some point, Rachel got everyone’s attention to announce best in show (she didn’t announce any others, which is just as well: there were so many, really!). I was on the far side of the room from her, so struggled to hear at first until the chatting died down. 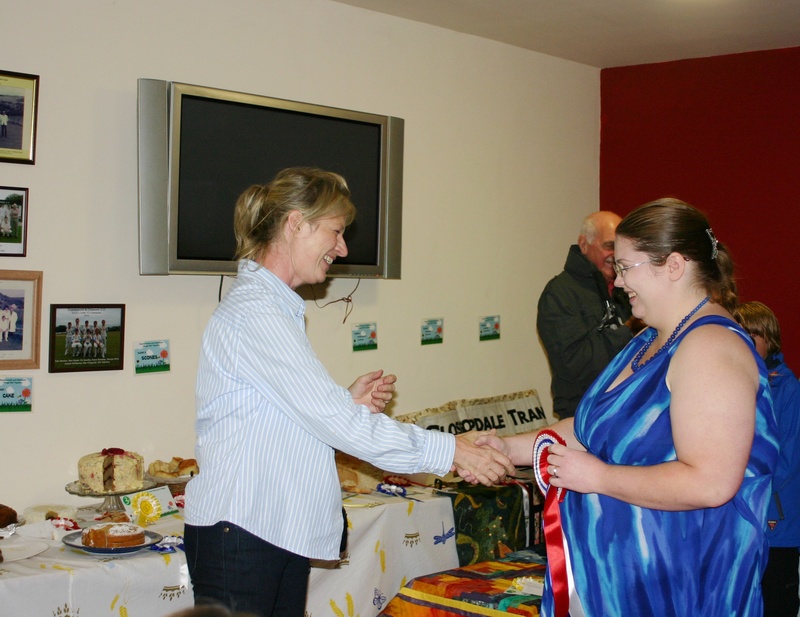 She impressed on all of us that the judges had a very hard time choosing a Best in Show, since the classes were all so very different (comparing apples and oranges, basically). 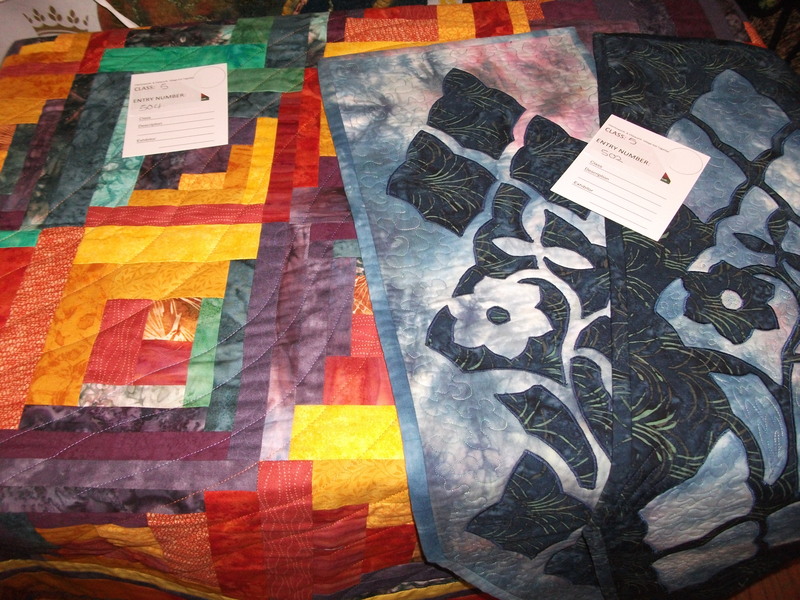 Then she said which class the Best in Show came from – I was fully expecting it to be one of those beautiful pieces of patchwork from the sewing class. I didn’t understand what she said, because my brain did that thing where it didn’t hear what it expected, so it couldn’t make any sense of what it heard. Then she called out my name, and I started, and I’m sure I uttered something, and started walking towards her, on auto-pilot. After a few steps, I came to, and wondered if I was meant to go to her or what – wait, I don’t know, what am I supposed to do?! 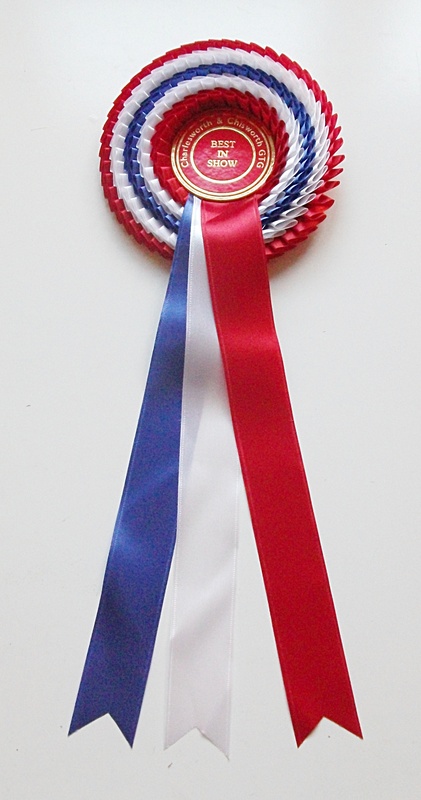 Everyone was applauding and smiling at me, though, so I carried on, and Rachel gave me the Best in Show Rosette, which I took in a daze. There’s a whole nother story to tell from today, of course — the people, the day, the groups, the connections — the actual point of the day. I was going to make that part two of this entry, but this has gotten long enough that I shall close this here and post that part as a separate entry. Stay tuned! 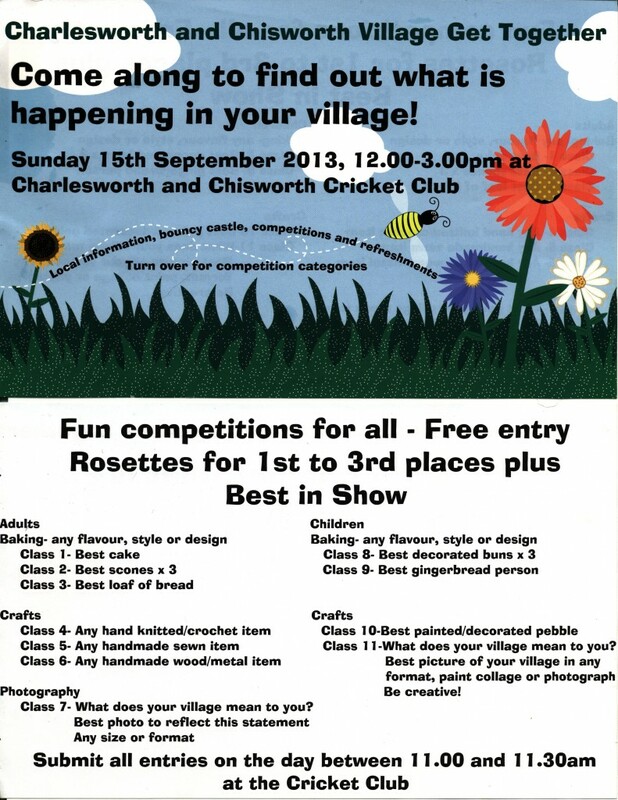 No Responses » Tagged with: baking, Charlesworth, photos, yay!